Noches de Ciencias (Family Science Night) is a national initiative from SHPE to promote knowledge and interest in science, technology, engineering and math (STEM). 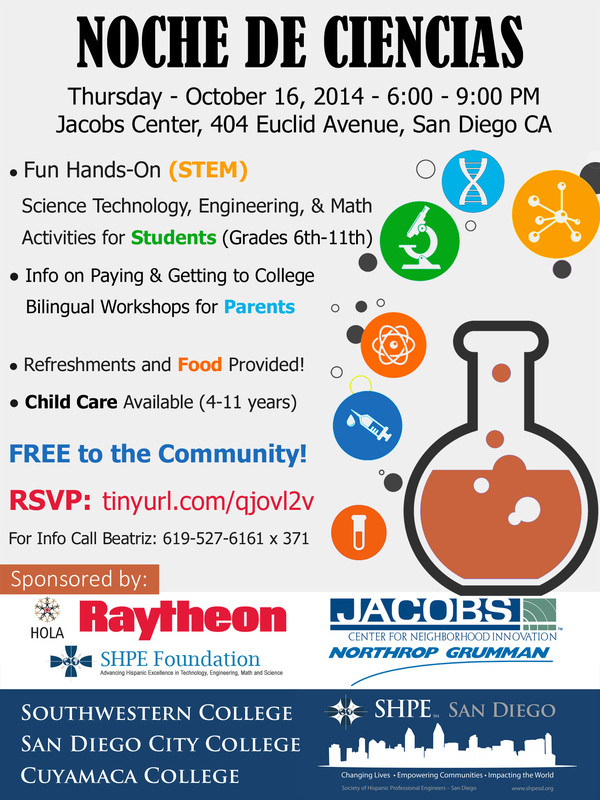 The goal of Noches de Ciencias is to inform K-12 students and their families about STEM education and college options through FREE interactive workshops and activities. Noche de Ciencias es un evento GRATIS y reconocido a nivel nacional que sirve para involucrar a la comunidad hispana en un ambiente divertido y relajado con actividades científicas y de ingeniería, y para promover el conocimiento de la universidad en un entorno bilingüe. El objetivo de la Noche de Ciencias es facilitar el acceso y el conocimiento de carreras en STEM (Ciencia, Tecnología, Ingeniería y Matemáticas) con el fin de ampliar la participación de los hispanos a lo largo de todos los segmentos de la vía de la ciencia y la ingeniería. The 3 hour program walks students through multiple hands-on experiments that spark their imagination and gets them thinking about how our world works. Parents are the Biggest influence in their children’s lives. Our parent workshops cover: the importance of education, paying for college, what it takes to get their, and how to best support their kids. Our panel of Seasoned Professionals and Parents of Engineers provide an insight to attendees on what their children’s future could look like with the right support and guidance. During the course of the program, both parents and students are provided with FREE food and refreshments. We conclude the program by giving away some cool raffle prizes before sending everyone on their way home. Best of all, the event is FREE. There is no cost to the attendees. The event is hosted to provide resources for our under-served communities by the following sponsors.